This tutorial explains how to combine / append data sets vertically with PROC SQL. Suppose you have two data sets and we need to combine these two datasets vertically. For example, if a dataset A contains 10 records and dataset B contains 10 records. I want combined dataset would contain 20 records. It displays all rows from both the tables and removes duplicate records from the combined dataset. By adding ALL keyword, it allows duplicate rows in the combined dataset. 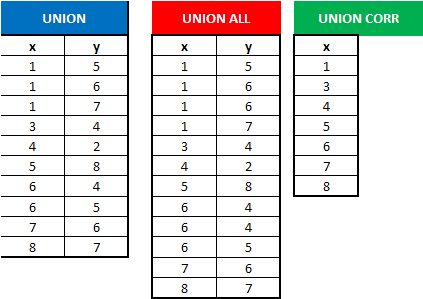 UNION is performed by position not by column name. 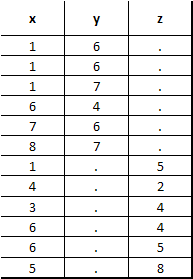 Hence, common columns in each SELECT statement should be in the same order. If CORR keyword is included, PROC SQL matches the columns by name. ALL keyword allows duplicates in the concatenated dataset. It appends (concatenates) two tables. It is equivalent to SET statement in Data Step. It allows duplicates in the concatenated table. The ALL keyword is not required with OUTER UNION. It returns unique rows from the first query that are not found in the second query. (Non matched Rows). It removes duplicate records (where all columns in the results are the same) - row 2nd in table1. It allows duplicate records in the combined dataset and does not remove duplicates. It displays only columns that have the same name (or common) in both the tables. It returns all unique rows in the first table (based on the common column) that do not appear in the second table. 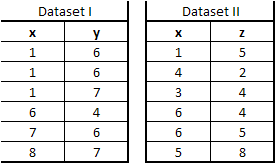 It selects unique rows that are common to both the tables. 13 Responses to "Combining Tables Vertically with PROC SQL"
Thanks for providing easy to understand examples and language which helps t grab complex things much easier. Are you clinical sas programmer? Can you please explain the difference between inner join and intersect with same example.